We are assuming that you have completed all the Sentence Master exercises. 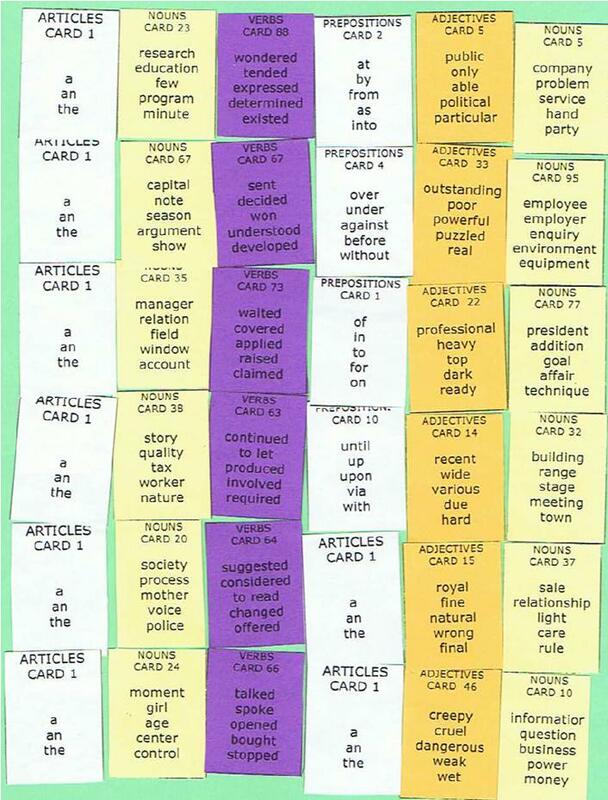 We are assuming that you have completed all the one word card: article, adjective, adverb, preposition, conjunction, verb, noun and pronoun exercises. We are assuming that you completed all the two, three and four word card exercises to form complete sentences. We are assuming that you have completed all the 6, 8 and 10 word card practice challenges and are looking for a more advanced test of your English language writing skills. This Sentence Master English Writing Grid Quiz has 6 lines of 6 word cards. Players can use only one word from each of the word cards to create six or seven word English sentences. Players can create sentences with word cards that touch each other starting from left to right. Scoring is one point for each complete sentence. Player with the most complete sentences wins. The manager waited in heavy equipment. Sentence Master English Writing Grid Quizes are free to practice specific sentence construction skills, using the parts of speech, phrases and clauses.